Apparently the loyal fans of the iPhone aren’t taking the “Droid Does” commercial attacks lightly. 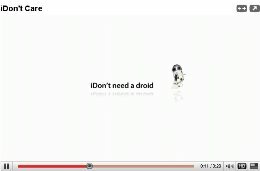 Apple (iPhone) fans have put together a response to the Droid Does commercial that promotes Google Android phones. Hey there – thanks for commenting on the post. Although I don't agree with you, I do appreciate your comment and visiting the site! Please let me know if you'd like to see articles on a particular tech / social media / seo related topic!